We’ve talked about the dangers of air fresheners in previous posts. Today, I’d like to focus on Febreze Air Effects, a Proctor & Gamble product advertised as making odors, no matter how offensive, disappear. A test by the Environmental Working Group (EWG) found that this product, like most synthetic air fresheners, releases a number of potentially harmful ingredients. The EWG evaluated Febreze in 2009 to determine its safety as a school cleaning supply. Results showed that the product (Hawaiian Aloha option) released 89 air contaminants, including one carcinogen. Yet the manufacturer discloses only three of those ingredients. This was a particularly high number-the third highest released by any product tested. According to the label, the air freshener contains only an odor eliminator, water, fragrance, non-flammable natural propellant, and quality control ingredients. Could they get any more vague? Is it time for you to change your methods of freshening your home? Here are seven reasons why we think you should switch to more natural methods like opening a window, burning a safe candle, using baking soda and vinegar to absorb and remove odors, or using an essential oil diffuser. 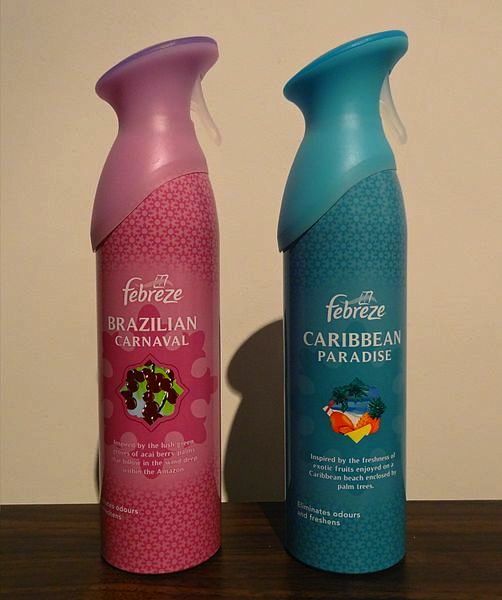 Febreze and other chemical air fresheners do not remove the odor molecules-they simply cover them up. The odor molecules are still there, you just can’t detect them anymore. So after spraying the product, you’re not only inhaling the odor molecules, but the air freshener chemicals as well. Have you stopped using Febreze and other chemical air fresheners? Please share your thoughts. Picture courtesy Kroock74 via wikimedia.org. “School Cleaner Test Results,” Environmental Working Group, November 3, 2009, http://www.ewg.org/research/greener-school-cleaning-supplies/school-cleaner-test-results. “New Study: Common Air Fresheners Contain Chemicals That May Affect Human Reproductive Development,” NRDC, Press Release, September 19, 2007, http://www.nrdc.org/media/2007/070919.asp. “Evidence on the Carcinogenicity of Tris(1,3-dichloro-2-propyl) Phosphate,” Reproductive and Cancer Hazard Assessment Branch, Office of Environmental Health Hazard Assessment, California Environmental Protection Agency, July 2011, http://oehha.ca.gov/prop65/hazard_ident/pdf_zip/TDCPP070811.pdf. Every time I use febreze I get a serious headache and it really isn’t worth that trouble to get a nice smelling room house etc.., you can just get a nice smelling room bye opening a window and burning a candle. I can’t tolerate fabreze, odoban, most perfumes, and most air fresherners. Especially vanilla scents bother me. Many people enjoy these odors, but for me it’s like i’m breathing poison or toxic waste. I just sprayed Febreze Pet Odor Eliminator about 7 times in the air throughout my house, about 2 and a half hours ago. My girlfriend and her 3 kids are at her parents. I have half the windows open in our house and a fan blowing out one of them, and it is below zero where I live right now, but that is not the worst of it. Shortly after I sprayed it, my extremities started getting cold, I started seeing spots and getting twitchy, and our 2 dogs started reacting to it. I have been going outside and coming back in frequently, got online, and found this blog about the potentially harmful effects of this product. I am taking the word ‘potentially’ out of my book on Febreze. I have had the windows open and a fan running since it happened, even though it is below zero outside, and I still don’t know if it’s safe to stay in this house right now. Same as Gail, Fabreeze gives me instant headaches. I asked that it be removed at work. Does anybody know how to NEUTRALIZE Febreze? I have a borrowed piece of medical equipment that I will return after overnight use, and I know from past experience that the stink on it will make me suffer! It’s only smells, people. Quit smoking and get used to it! I was so stupid….I bought an air filter for our air handler that had a Febreeze thingy inside it. It was supposed to filter our pollens, dust mites, etc., etc. and leave a clean sent in the air. After just 12 hours it almost sent my husband to the hospital. I didn’t even think of the effects it would have on his breathing–he works at home, and when I got home from work he looked like he was having a full blown asthma attack. I am so sorry I bought this product. No warning label or anything….quite the opposite, that it was going to make our air “clean”…. Oh my gosh, Carmel. Who would have suspected it would do that, huh? Thank you so much for sharing your story! You may just save another person from the same thing. Is there anything that can be done to get this stuff off the market? Are there any current lawsuits against the makers of this poison? I’m not aware of any legal action concerning Febreze, but that doesn’t mean there isn’t any. I think it’s best to spread awareness and encourage people to use other air freshening options for safety’s sake. Consumers can make a difference when they work together. Another reason not to use febreze is that it is highly flammable. My nephew can concur, seeing as how he has spent months in a hospital, and has had countless skin grafts, and how his medical bills are over one million dollars. He is 7. Once it becomes dry, it becomes more flammable than when it is wet. My sister sprayed febreze on a couch, and my nephew rolled around on it, then tried to put out a candle. Stay the hell away from febreze. Oh my gosh. How terribly tragic. Thanks so much for sharing the story and all my best to your nephew for a full recovery. Hi, Elizabeth. Our neighbors can make our lives difficult if they want to, can’t they? Though there are toxic chemicals in Febreze, I would be even more concerned about the cigarette smoke if I were you. Either way, without knowing how close your garden is to her garage, it’s difficult to gauge any potential contamination, but the truth is that we’re exposed to chemicals whenever we go, and there are always others who are less aware of the health effects than we are. With varying wind speeds and all, I wouldn’t think much of the chemicals would actually get on the plants themselves. I would just make sure you wash carefully the vegetables that you harvest, but honestly, they are going to be exposed to a lot fewer chemicals than those that are produced commercially, so that’s a good thing. I can’t advise you on how to deal with your neighbor, but if it were me, I would hold good thoughts of her in my head. She is addicted to nicotine which is a powerful drug, and difficult to shake. She must be concerned about the smoke smell, which is why she’s spraying Febreze. Maybe you could come up with an alternative, natural air freshener that you could give as a gift? Otherwise I would invest in an air purifier for your home, and position the garden far away from the garage in the future. Best of luck to you! To Campervan Mum: As you have discovered Febreze is difficult to remove from surfaces once released. Where possible, sunshine can break Febreze down on some surfaces and fabrics. For hard plastic surfaces try wiping with olive oil (remember you will have to clean the olive oil off, so use sparingly). For wood, try lemon oil (do not use detergents to clean lemon oil off, as detergents can damage the wood; wipe and let dry). For glass, use diluted ammonia, or rubbing alcohol. Use gloves and eye protection and ventilate well during your cleanup. Esters from natural oils work as carriers through the membranes of your skin cells, carrying the Febreze, and any other chemicals present, into your system. I’ve had success with ester containing oils breaking the bond of chemicals & fragrance in the Febreze to surfaces (including my hands) and permitting the Febreze to be washed away. For wood surfaces, test the oils on a hidden or discrete area to be certain there aren’t unwanted color changes. Wow! Thanks so much, Troy! I sprayed my secondhand camper with fabreeze – BIG mistake – confirmed by this site. Two nights of sneezing and wheezing which was terrible!! Is there anything to get rid of the chemicals?. Oh dear! So sorry for the reaction. It can be difficult to get the chemicals out once you’ve sprayed. I’m sure you’ve already opened some windows. Cleaning the surfaces that were sprayed with mild soap and water will also help. If you have furniture in there, try an eco-friendly furniture wash. Throw blankets and other linens in the laundry. A pain, but worth it if you’re to feel comfortable again! Good luck. I had a large exposure to Febreze in 2006 while I was at College. I had anaphylactic shock and since then, I have been fighting for my life with a number of respiratory conditions,neurological conditions, psoriasis and some very rare conditions such as Tietze’s Disease and Vocal Cord Dysfunction. I am extremely allergic to all chemicals now so I have been confined to the house for over 7 years and cannot even have visitors. Febreze ruined my life and I am glad you are spreading the word about the danger of using it. Hi, Dave. Oh my goodness. Thank you for sharing your story but I’m sorry to hear about your sensitivities. It must make life very challenging. I’m sending my best wishes for your strength and improved health, and thank YOU for bringing a personal touch to this post and letting people know that chemical reactions are very real and can be potentially very dangerous. All my best. Febreeze is one of the worst products for me that results in a Migraine in just a matter of a few minutes. Hi, Gail. Thanks for writing in. I think a lot of people share your symptoms, but many don’t know what’s causing it. I don’t use these products. I boil vinegar in water with some cinnamon, cloves etc and let simmer. Just some vinegar in water in a bowl left to stand does wonders as well. I live in an apartment building and one of the biggest problems is having a shared laundry. The smell of those detergents are like cling ons, you can’t get rid of the smell. It pervades everything you wash. Tide is the absolute worst. It is hard for me to go into the laundry room at times as the odour is offensive to my sensitivities. These should be banned in communal laundries. You should post a list of the toxic substances in those products and, also, dish detergents. Thank You so much for all your great work and reporting and quality of references listed! I have dedicated my life and healthcare practice & ministry to educating patients about toxins in and out of their body and its relationship to the disease they experience. I am honored to be able to refer everyone to your site. You are saving lives! Dr. Willeford, thanks so much for your feedback, and thanks for spreading the word about toxins in our lives! I think that working together we can make our world a cleaner and healthier one. I truly appreciate your support! CV Skinlabs Goes to the Emmys’ Style Lounge This Week in LA!